Traditionally guitars have had a single soundhole located at the front of the guitar to allow the sound to escape and be heard by the guitarist and the audience. There have been many variations on the shape, size, style, and placement of the soundhole with varying levels of success. In recent years however a movement amongst luthiers to place a soundport or sound portal on the upper and sometimes the lower bout of the guitar has gained momentum and acceptance into the classical guitar community. Personal monitoring. A soundport can act as a 'stage monitor' allowing you to hear your instrument with increased clarity. This is particularly important in ensemble playing where the guitar is usually easily lost in the mix. Ensemble monitoring. With a soundport more of the guitars' sound is being projected upwards and to the side thus giving the opportunity for your fellow performers to hear you more clearly. Brightness. A soundport can open up a dull sounding instrument. How this is achieved isn't exactly known but many owners that have added a soundport(s) to an instrument have remarked that their guitar sounds brighter with increased resonances and higher frequencies. Fine tuning. 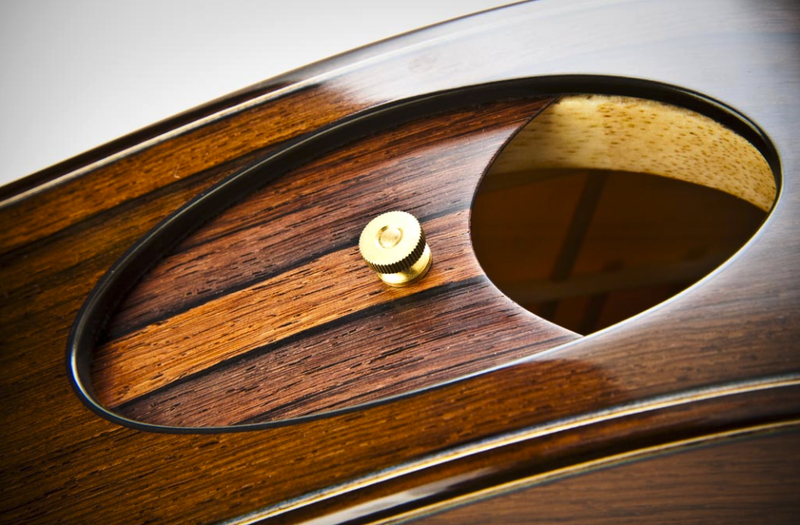 From a luthier's perspective a soundport can enable 'fine tuning' of the instrument whereby the a luthier can alter the size of the soundport to adjust the high frequency response attributable to the changing cavity resonance. It seems that not all soundports are created equal - some are huge, some are perfectly round whereas others are an oval shape. To complicate matters further some can be partially or completely closed using magnetic systems or as you see in the first picture in this article others have a sliding design that will allow you to adjust the size of the soundport. The image at the beginning of this article features a 'sliding soundport' by Florian Vorreiter. Rather uniquely that soundport is actually located at the lower bout of the guitar just below where your forearm rests on the guitar. Check out this amazing photo build and article of a magnetic soundport cover system by Carlos Juan Busquiel. All in all it does seem like a soundport or soundports are a wonderful innovation in the classical guitar realm. It seems that they should become a standard feature on classical guitars along with an elevated fretboard (seem my blog article on elevated fretboards here). The advantages of having one or two on your guitar are great.